Happy Wednesday!!! Today on the blog, I’m taking a walk on the wild side! 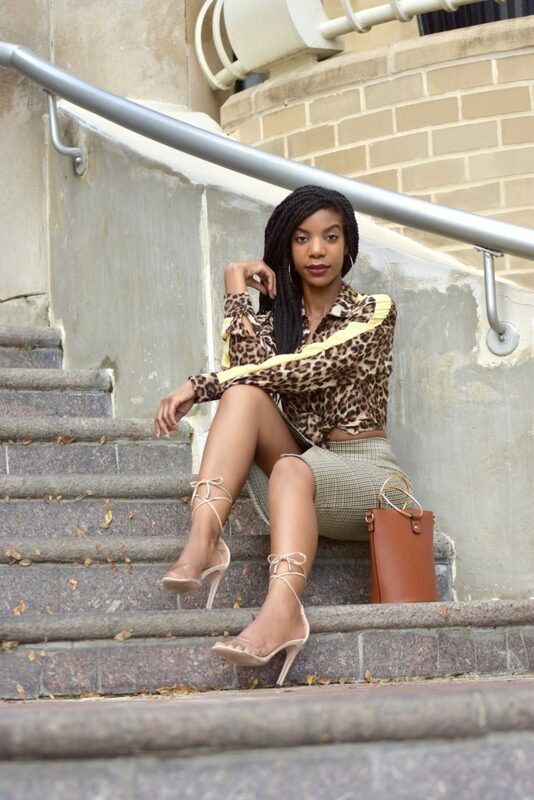 I’m rocking this cute color block leopard print shirt from SheIn, AND mixing prints with this houndstooth skirt at the same time! Watch out now, lol. Sponsored post, but all opinions are my own. Contains affiliate links. Up until a few years ago, I had an obsession with leopard print. I mean my mom even bought me a leopard print comforter with matching accessories. And then, just like that, I got over it. Now that leopard print is one of this season’s top trends, I realize that I still love it. So when I saw this top, I had to get it. The yellow stripe down the sleeves adds another cute fall trend for the icing on the cake, if you will. This top is lightweight, and a great quality. It fits true to size, and I’m wearing an XS. 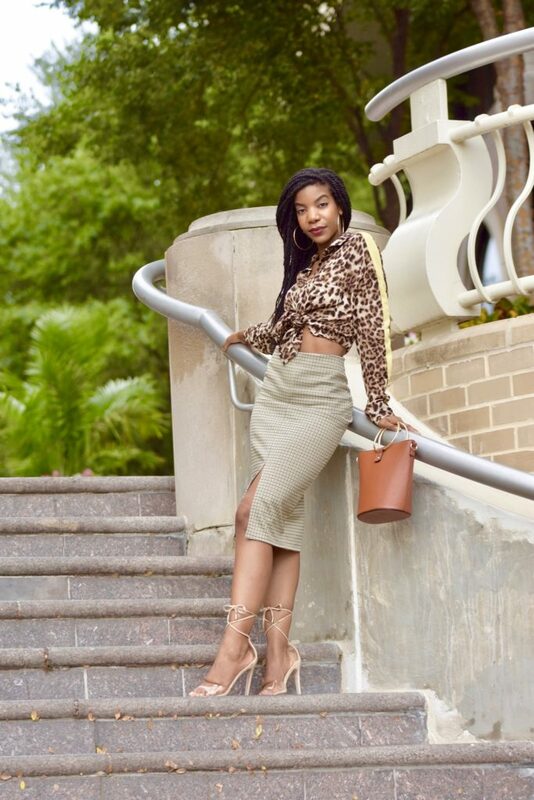 I was out shopping for an event, and thought this skirt was cute and would look good with this tan concert tee that I’ve been wanting to style lately, but then I noticed the colors worked well with the leopard print, so I decided to go with a mixed prints look. Since the skirt is high waisted, I decided to tie the shirt in front to really show off the waist. I can also see myself wearing this shirt with trousers for a business casual look, or with a short leather skirt for a night out look. 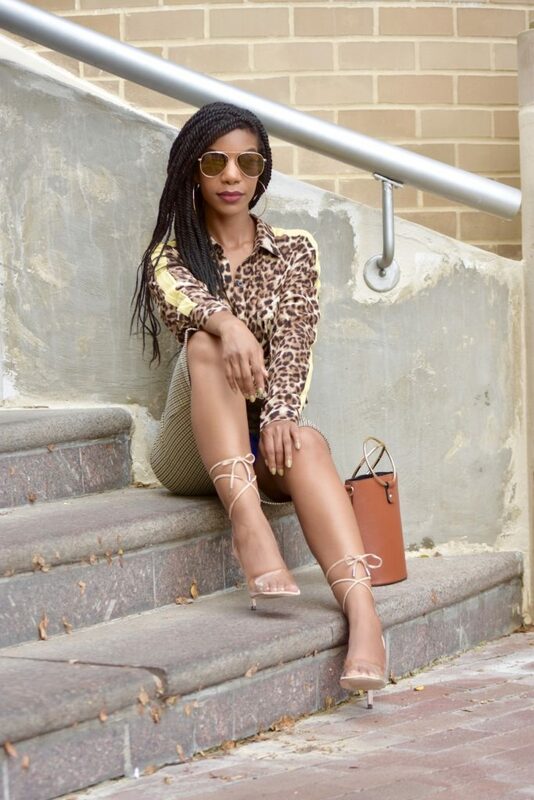 I wanted to keep my accessories fun and simple, so I went with my signature large gold hoops, and these clear lace up heels that are a new fave. Also, I had been wanting an o-ring cylinder purse for the longest time. I happened to walk into Forever21 for a quick pick up, and honey, let me tell I ended up leaving with so much stuff because they were giving 21% off of your purchase if you spent $50 or more! Thanks for reading! 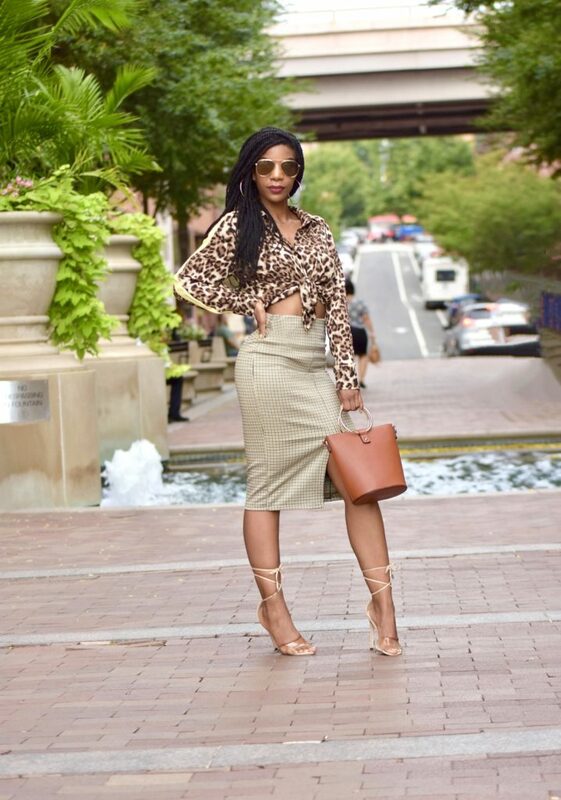 Are you going to rock leopard print this fall? Let me know below! This look is fierce! Loving this style on you, Kasi! Thanks for the 20% off code! Cute look! Love the mix of patterns here. Animal print is so in this fall! I’m loving the skirt and bag. I would rock that shirt every chance I got. I really love that skirt and the bag. You have amazing style. 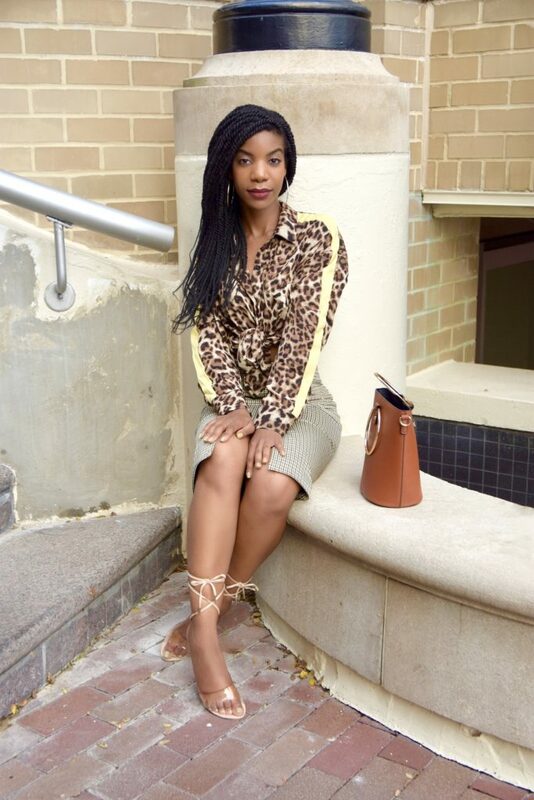 Leopard leopard leopard are 3 of the best words ever in fashion,,you look awesome girl ! I would rock this entire look top to bottom. You always need leopard print in your wardrobe. The stripe down the sleeve is my favorite part. I’d love this shirt as a jacket. Leopard print is one of my faves. Love how you paired it. You made this outfit work. It looks awesome on you, but I wouldn’t dear. It just wouldn’t look the same. You definitely worked it! Oh that leopard is so much fun. I love the yellow stripe down the sleeve. It adds such a fun vibe to your look! Girl I would of never thought these two different prints would go together. You did it and I love that its officially Houndsooth season! YESSSSS to this fall style! I love how you paired this outfit!